The value of the Argentine peso was strictly controlled for years under former president Cristina Fernandez de Kirchner. Argentina's currency just plunged by 30%. But don't panic. It's all part of new President Mauricio Macri's larger plan to revive the country's troubled economy and encourage international trade. 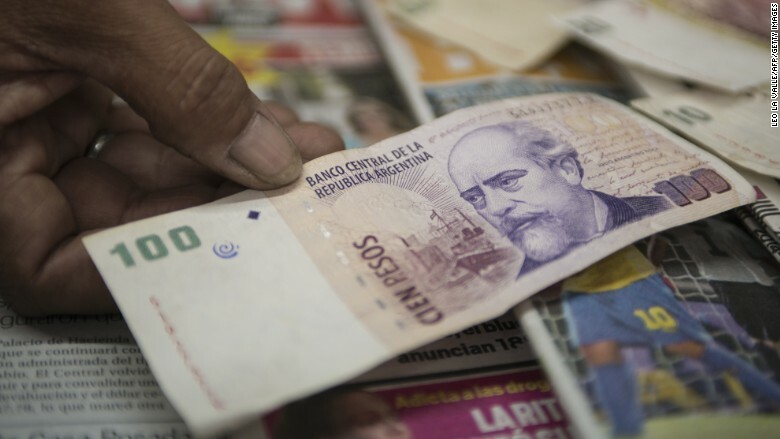 Argentina's newly installed government announced Wednesday that it was removing strict currency controls that had been in place for the past four years under former president Cristina Fernandez de Kirchner. That means the currency will no longer be pegged to a level around 9.8 pesos per U.S. dollar. It was trading around 14 pesos per dollar early Thursday, a level previously seen only in the black market. The government hopes allowing the currency to trade freely will boost exports of agricultural commodities. "Those who want to export will be able to export without asking for permission. Those who want to import can import without permission," the country's new finance minister, Alfonso Prat-Gay, told reporters Wednesday. "This is how a normal economy functions in any part of the world." International investors welcomed Macri's election last month because of his promise to reform the economy. "The fact that the abolition of capital controls... happened so soon after President Macri's election is encouraging," said Neil Shearing, chief emerging markets economist at Capital Economics. "It's still early days, but Mr. Macri has made a good start to his term in office." Former president Kirchner put the currency controls in place years ago in an attempt to control Argentina's rampant inflation. Macri has only been in office for a week but he's making changes fast. He's cut income taxes, lifted export taxes and appointed a new central bank president. He has also secured financing from a group of international banks and appointed two Supreme Court justices.